The South Bank is a central Brisbane district packed with world-class attractions and experiences for visitors. It attracts nearly 10 million people each year, mostly to the South Bank Parklands, which were established on the former site of World Expo 88. 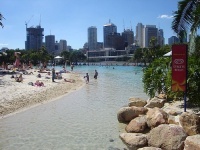 The Parklands contain Australia's only man-made beach and lagoon, right in the heart of the city, known as South Bank Beach. There are also rainforest walks, picnic and barbecue areas and water features. One of Brisbane's most popular tourist attractions, South Bank is also home to the Queensland Cultural Centre, which includes Queensland Museum, Queensland Art Gallery, the State Library of Queensland, the Greater Union Hoyt's South Bank Cinemas and the Queensland Performing Arts Centre, which all line the Brisbane River proudly. Shoppers and fashion lovers will enjoy Little Stanley Street, where all the latest in fashion can be picked up from the boutiques and retails stores lining the strip. The South Bank Art and Craft Markets take place every Friday night, as well as every Saturday and Sunday during the day. Visitors should head to the South Bank Visitors Centre which provides information on current events, including cultural activities, accommodation options, event information and details regarding restaurant and bar facilities.